I've not been good at all about doing this once a week. It's the busy season with work, so time is at a premium. I think I will go for doing it 52 times this year. I did try a couple of things last week. Unpinned them because they were things I can NOT do. Looked simple enough, but that's how it goes. Looks are deceiving. 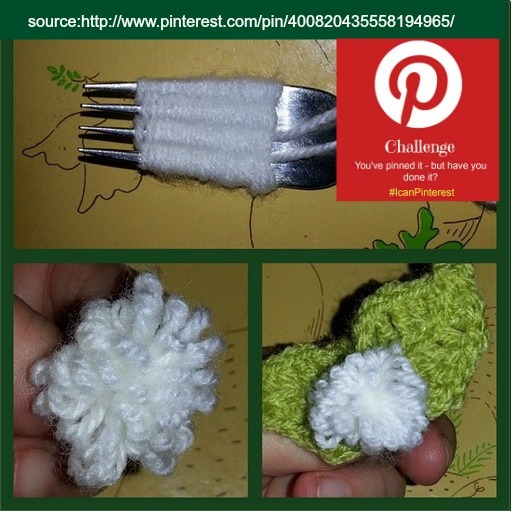 To make a fork flower cut a piece of yarn and lay it in the middle of the fork, between the tines. Then weave yarn back and forth around the tines. When the fork is mostly full cut the yarn off and bring the tail you placed first up on both sides and gather the woven parts. Tie off tightly. Crochet leaves if you want. Obviously I did. chain 3 and ss in last chain. ss in chain from turn. ss down the center of the leave to give it a spine. You can make them separately or do what I did. When you get to the base with the ss for the spine just chain 9 more and repeat the leaf before fastening off. secure fork flower in the center and you're done.